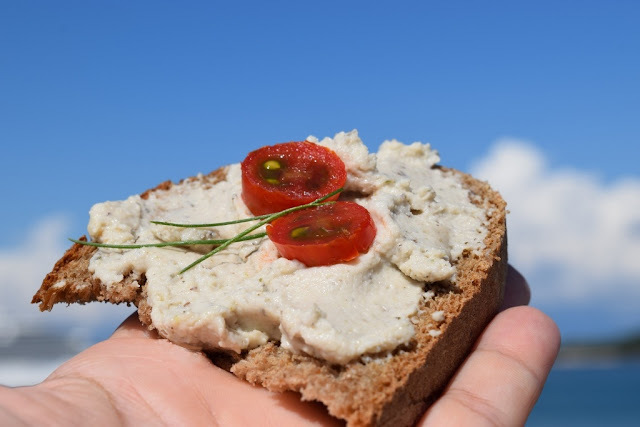 Vegan in Corfu: Vegan cheese spread to go to Heaven. As many vegans do, one of the things I really missed since I started a plant based diet was cheese. It was never sitting well with me, but I adored the taste in my mouth when I ate a piece of old Spanish cheese together with a glass of good red wine. On the other hand, quitting meat was easy and a relief, but a bite of cheese on some fresh bread was a part of my daily diet. Since I decided leaving cows and sheep alone, I've been trying different recipes I have found all over the net, but this one is really easy, cheap and tasty. Let's go. This recipe was originally published by Emily von Euw in www.onegreenplanet.org, but I have changed it a little bit. 1. Soak the cashews overnight in a bowl, or at least for two hours. The more hours they will be, the easier they will blend and the creamier it will be. 2. Drain the cashews and place all the ingredients in the mixer. 3. Blend for at least two minutes, scraping the inside of the blender with a spatula in order to mix it all well. Spread it on a piece of black fresh bread and crown it with two pieces of baby tomatoes and some chive, or whatever you find in your garden. Homemade easy and cheap cashew cheese, Ionian Sea and Greek skies.